Most beginners use either baitcasting rods or spinning rods for fishing. Let us watch this short video to understand the difference between baitcasting rods and spinning rods. Now, let us move to our first section: What is a spinning rod? Spinning rods are the most preferred fishing rods for beginners. Ease of casting, lack of any backlashes as well as easily replaceable spools make them very popular with anglers. Spinning rigs work best with live baits and small lures The spinning rod, reel and line selection you make depends on fish species you wish to catch. Spinning rods come designed in such a way that the reel seat hangs below the rod. Both beginning and seasoned anglers know quite well that choosing a spinning rod depends on several features. The features of a fishing rod determine its performance. You should consider these features carefully while choosing a spinning rod. We will discuss some of the prominent features of spinning rods here. 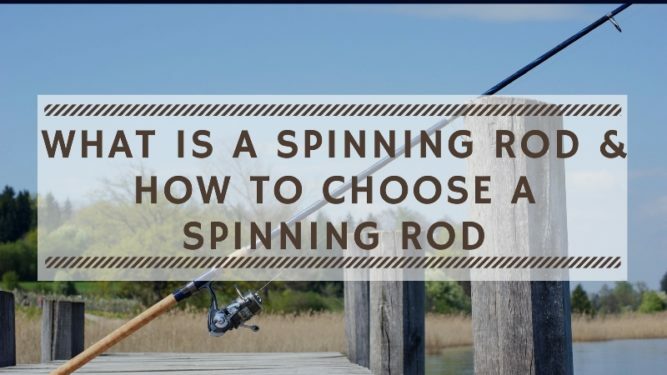 This would help us better understand what is a spinning rod. The most common material used to make spinning rods’ handles are EVA and cork foam. Traditionalists would go for ones made of cork but the quality rods are made using both materials. Cork makes the highest quality rod handles. Rod handles made from EVA foam are resistant to stains. Some spinning rods come with two handles. Models with two handles tend to produce better results, especially over long casting periods. Recently, spinning rods have undergone innovation and rods with short foregrip are very popular. A short foregrip allows the angler to place a finger on rod blank. Once the finger is placed on the blank, any bite is detected no matter how delicate it is. Some spinning rods come with more ergonomic handles. These are preferred for long day anglers due to its comfort. A reel seat is where the reel gets attached to the rod. A quality reel seat is very important, more so in case of fight stress when pressure is applied. Make sure that your rod comes with a reel seat that accepts reels from most major brands. Consider going for ones with cushioned hoods that snugly fit when tightened. Spinning rods have the line guides aligned on the blank’s bottom. The guides are aligned in a gradually descending size. As you move down towards the reel, the diameter of the line guide increases. On the other hand, the diameter of the line guide reduces as you move towards the rod’s tip. The flexibility and length of rod determine the number of line guides. A higher number of guides are required for more flexible rods or longer rods. The line guides affect the casting distance as well as the battle. Therefore it is important to consider the quality of line guides when choosing a spinning rod. The rod action defines how the rod will perform while reeling and casting fish. Rod actions are categorized as slow, moderate or fast. The action of a rod is also related to the weight and size of baits you are using for fishing. For instance, light action rods tend to achieve maximum casting distance with smaller baits or lures. Most quality spinning rods these days are made from fiberglass, graphite or a combination of them. Although graphite is considered as rigid and fragile, it works best to bring out fighting power and flexibility in spinning rods. Fishing rods are generally classified into heavy, medium-heavy, light and ultra-light. If you wish to catch smaller fish, then you should go for fishing rods with less power. But if you plan to catch large fish such as bass, then you should go for heavy or medium-heavy fishing rods. Longer spinning rods are suitable for fishing in lakes and other large water bodies. Long poles are heavier and hence have the capability to lift the heavy catch from deeper water bodies. Shorter spinning rods are suitable for fishing in shallower water bodies such as ponds or rivers. But consider a long spinning rod for fishing on rivers with strong water currents. So in this section, we discussed what is a spinning rod and the features of a spinning rod. Now, let us move on to our next section how to choose a spinning rod. Fishing is a fun, relaxing, invigorating and entertaining activity to spend time on while on holiday. It can help you connect with nature. When planning to go for your first fishing trip, your essentials list could feature many things. Fishing rod, reel, line, tackle, sunblock cream, insect repellents, fishing waders, and maybe a rain suit. Well, in this section we will help you pick your first spinning rod. We are sure you have a plenty of questions on your mind while checking out different types of fishing rods. But the first thing is to look for ease of use. Also, look for a spinning rod that offers a wider spool for reduced line twist and increased casting distance. Now, we will help you choose the right spinning rod step by step. Check how much pressure you have to apply to bend the rod. You could see the rating for the product, on a scale of 1 to 5, to know which is the easiest. Heavier rods are better for fishing but require more control. Light rods are great if you plan to fish in shallow waters or if you are looking to capture smaller fish. We recommend beginners to go for Light or Medium-Heavy rods, which can be used to catch most fish such as trout, bass etc. Flexibility is how much the rod would bend. You can check the speed rating to know when the rod will stop bending. An ultra-fast rod, for instance, can only bend up to 3-4 inches. The flexibility will determine whether you can catch lightweight or heavy fish. Fishing rods come in different lengths. The longer the length, the stabler the cast. You are also bound to get a better swing on longer rods. Longer rods also help you easily maneuver when you catch a fish. But, again, longer rods require more control. We recommend beginners to go for rods 7 to 9 feet long. You have two choices here – crankbaits or spinner baits. Choose one according to where you would be fishing. Crankbaits work better in shallow waters. Most crankbaits come with a treble hook that just about goes inside the mouth of the fish. Crankbaits work great with spinning rods as they offer right power and speed. There are also a few other things to look at, like the grip you need and whether the fishing rod fits your hands perfectly. EVA foam and cork are the two materials normally used to make fishing rod grips. The material of the rod plays a part too – you should go for rods made of either graphite or fiberglass. Spinning rods made of graphite are lighter but the ones made of fiberglass are more durable. You might also want to check the line guides, and whether they are durable. Line guides help you detect the bite and transfer the fishing line through the rod blank. We hope we were able to answer the questions What is a Spinning Rod & How to Choose a Spinning Rod.